Even with a broken multiplayer component, the value proposition for this release is very high considering all the campaigns it includes…right before 2015’s release of Halo 5. Going into reviewing a release like this one is an intimidating prospect, just because there’s so much game here. Video game remasterings and re-releases aren’t anything new, but with the power and capability of the new consoles now firmly starting to take root in the lives of gamers everywhere, it was likely only a matter of time before we found ourselves with the ability to play something like this. Halo: The Master Chief Collection on Xbox One, announced at this year’s Xbox media briefing at E3, is the ultimate must-own anthology for anyone that’s ever enjoyed playing a game of the platform-defining franchise, because while all of the moments from each of the four main games’ stories are intact (or looking better than ever), you also have four distinctly different multiplayer games all accessible from a single interface. It’s the sheer volume of variety and the technical tweaks to the presentation that are the true stars of this release, and while there are a few elements of the full, four-game experience that may be a bit different from how you remember them, many of the additions are positive, and should effectively place you back behind the visor of the Master Chief just in time to see the next phase of his story in Halo 5: Guardians. A look at the unified menu, where you can access all four campaigns, in addition to the insane amount of multiplayer options. The most obvious thing that fans will notice upon booting the game up for the first time is the unified interface. 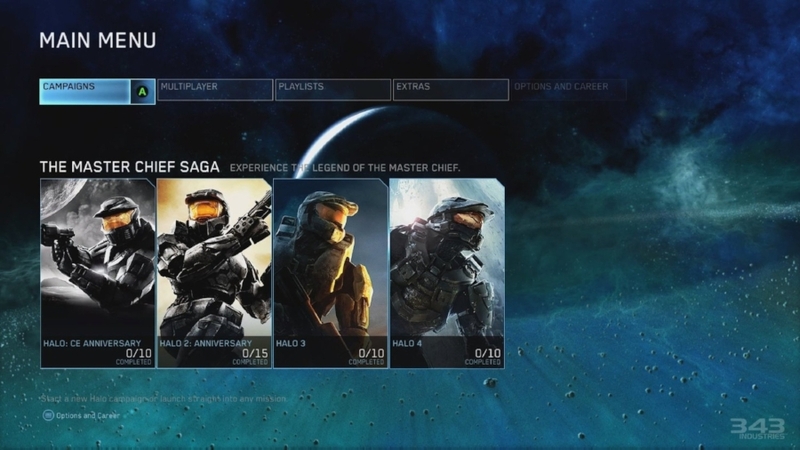 From the main menu, all of the single and multiplayer options are all available right from the start, meaning you can play the very first mission of the first campaign, “Pillar of Autumn” on Halo: Combat Evolved, or the very last mission of the last campaign, “Midnight” from Halo 4, in any order you wish. From the campaign side of things, all of the “skull” game modifiers are available as well, and while you don’t have to search the first three campaigns to find them in order to actively use them, you can still track them down for specific corresponding achievements. Single player gameplay has been given the addition of campaign-specific playlists across all the levels of the four games, and some of the choices are pretty creative. If you want, you can play Master Chief’s entire story in chronological order from “Pillar of Autumn” to “Midnight” on a single playlist, or you can even play levels together from the four games that have a single unified theme: want to play all the tank levels across all the games? Go for it. Want to play all of the final missions of each campaign back-to-back? You can. There are a multitude of different ways to take in some of the best moments of the single player campaigns, and if you enjoy those games and stories, then you’ll find a lot to take in here. Multiplayer options are even more vast than those of single player, because there are over 100 multiplayer maps and a plethora of different game types you can choose from right there in the menu. Whether you want to play a Capture the Flag game on Blood Gulch from Halo: CE, or a Team Slayer on Cold Storage from Halo 3, all of the options present allow you to dive headfirst into any conceivable game type and map from across all four games within seconds. As you can tell, the retouched visuals for the gameplay engine in Halo 2 Anniversary are very extensive, and perhaps even more impressive than the retouches made on the first game in 2011. Of course, the presentation of the games themselves is also downright extraordinary, and one of the most touted visual features of the Master Chief Collection is the resolution and frame-rate. 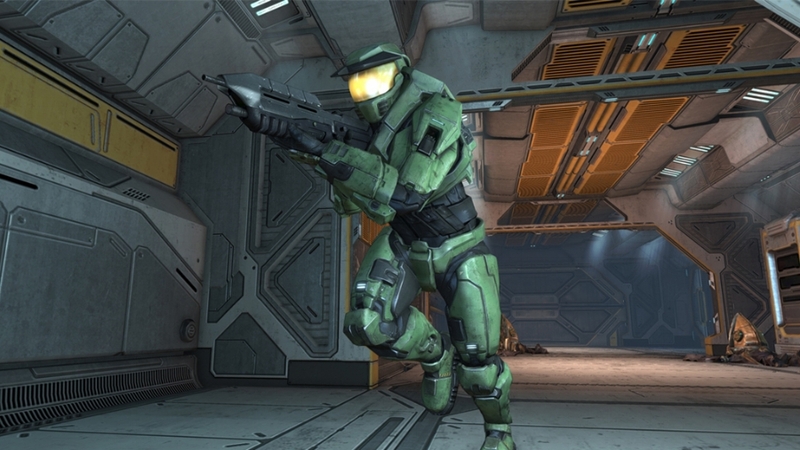 All four games, including the anniversary retouches to both Halo: CE and Halo 2, have been optimized to run at 1080p resolution while maintaining a frame-rate of 60 fps. The resulting feel to the games is that there’s an even greater degree of fluidity to an already fluid gameplay system, and all of the games look absolutely stunning. Although they haven’t been visually remastered in nearly as significant a way as the first two games, both Halo 3 and Halo 4 look noticeably better in this release than their initial Xbox 360 releases in 2007 and 2012, respectively. Halo 3 benefits most notably from the increased frame-rate and more intensive lighting effects, while Halo 4‘s increased resolution shows off the already present amount of detail in an intense fashion, perhaps even placing that game on par with a lot of brand new current-gen offerings on both the PS4 and Xbox One. Halo: Combat Evolved Anniversary is back on this release, and the work of 343 Industries and Saber Interactive in bringing the original campaign new life is fully back with it, also benefiting greatly from the increased framerate and resolution. The ability to switch between the game’s original graphics and the remastered ones has also returned, but where you would see a bit of a delay in the transition on Xbox 360, on Xbox One its instantaneous, which is entrancing. Moving from the 2001 visuals to the ones released in 2011 is a bit of a mind-blowing experience, and definitely helps to make you appreciate the effort that went into remastering the original game. This is even truer of the remastering effort that has gone into Halo 2, the game that many people believe to be the seminal release of the series. Saber Interactive is back for to breathe new life into the Halo 2 campaign, bringing native 1080p visuals to the game that was probably in greatest need of a visual upgrade. The reason I say that is that in thinking back to my original play-through of Halo 2 on the original Xbox, the overall darkness and somewhat murky visuals that were commonplace on the Xbox back in 2004 didn’t seem to do any favors to, arguably, the most complex story of all the Halo games. With new visual clarity and fluidity comes a whole new lease on life for Halo 2, and as the centerpiece of the Master Chief Collection, this is the experience that shines. The new environments pop with spectacular vibrancy and clarity, animations are preserved and just as you remember them, and a completely re-recorded soundtrack makes for an absolute auditory delight with both the new, swelling score, and the sound effects which are crisper and more punchy than ever before. You can’t talk about Halo 2 Anniversary, though, without talking about the remastered cinematics. Take a look at the cinematic trailer in the embedded video. The new cinematics, created by Blur Studio (the same creators of the original Halo 4 cinematics), help push the clarity of the story even further, making for a very enthralling and extremely beautiful reason to play the campaign through to completion. All of the animation for the characters in the new cinematics was achieved through motion capture technology, so in addition to very realistic movements in the cinematics themselves, you have feature film-quality CGI effects bringing the characters and their environments to life. This is supplemented wonderfully by the remastered score and sound effects, with the only original element remaining being the voice work of the actors like Steve Downes (Master Chief), Jen Taylor (Cortana), David Scully (Sergeant Johnson), Keith David (the Arbiter), Julie Benz (Miranda Keyes), and many others. Similarly to the gameplay itself, you can also instantaneously switch between the game’s original cinematics and the remastered ones, but chances are that you’ll likely stick with watching the remastered versions. It’s certainly fun switching to see exactly how much more of the story you get to see through the efforts of Blur in recreating those story beats from the campaign. The new cinematics are almost worth the price of admission on their own, but when they’re surrounded by so much else to do, they prove to be the proverbial cherry on top of a fantastically dense amount of content already available. The Master Chief Collection combines the campaigns of all four Master Chief-starring Halo games onto one platform for the first time in the history of the franchise’s existence. Beyond the cosmetic alterations, though, the re-releases of these games aren’t simply the old stories told in a new engine (like the 2009 Mortal Kombat game): all four original experiences are preserved as they were when they were initially released, running on their original engines with all of the original gameplay elements intact. While you can now unify control schemes across all four games into something a bit more universal, that’s the only major functional difference, since all of the other elements are original and intact. Most notable of these is the respective designs of each original game, as well as the stories that they told. Halo: Combat Evolved, first released in 2001, was the game that started it all. It told the story of humanity’s primary military force, the United Nations Space Command (or UNSC), locked in a brutal war with the Covenant, a highly religious alliance of several different alien species that see humanity as an affront to their deeply-held religious beliefs. It was Halo: CE that introduced us to Master Chief Petty Officer John-117, or simply Master Chief. A super soldier from the UNSC’s highly secretive SPARTAN-II program, Chief is a no-nonsense, silent hero, trained from an early age how to be humanity’s most efficient force in dealing with threats of insurgency, as well as the Covenant itself. Chief’s distinctive look is provided by his MJOLNIR power armor, a heavy-duty exoskeletal suit that augments his physical abilities on top of his biological enhancements. He’s also aided by his A.I. companion Cortana, who resides in his armor’s onboard computer and provides information and technological assistance wherever she can. The original Halo details the UNSC starship Pillar of Autumn‘s escape from humanity’s former military stronghold on the planet Reach (whose fall is detailed in the game Halo: Reach). With the Covenant hot on the ship’s trail, it emerges from faster-than-light travel near a mysterious ring-shaped world, complete with atmosphere, vegetation, and rivers. The Master Chief is awoken from hypersleep just as the Covenant begins boarding the Autumn, and after helping the crew escape from the ship, the Chief crash lands on the ring world to discover that it’s in fact a superweapon known as “Halo,” holding an even more dangerous enemy than the Covenant in quarantine, that the alien zealots have unknowingly set free. Halo: Combat Evolved Anniversary effectively introduces audiences to the Master Chief and his world, along with solid design elements that would help to define the entire franchise going forward. The original game’s design is probably the most straightforward of the four games included here, but there are definite deviations in its linearity when it comes to some of the other levels. “Assault on the Control Room,” the longest level of the campaign, allows you to commandeer different vehicles and perhaps take out some enemies that you’re not technicallysupposed to contend with until some later parts of the level. “The Library,” which many believe to be the most difficult level of the game, was difficult to navigate before the retouches included in the Anniversary release, making it a bit more straightforward. Overall, the story of the original Halo game helped to define the rules of the world, introduced audiences to some truly timeless characters, as well as an expansive sci-fi universe that has gone on to capture the imaginations of millions of people. Halo 2 picks up shortly after the events of the first game, and sees a doomsday scenario begin to play out: the Covenant have found their way to Earth, forcing Master Chief and the UNSC to bring the fight to the aliens on their own doorstep. The story is also unique in the entire series for featuring a deuteragonist in the story in the form of “the Arbiter,” the disgraced former supreme commander of Covenant military forces that is blamed by the hierarchy for their massive defeat at the hands of the Master Chief, as well as the destruction of the first Halo. He is bestowed with the honored role of the Arbiter, carrying out the will of the hierarchy to silence “heretics.” The story then trades moments of focus between the Arbiter and Master Chief, eventually revealing corruption in Covenant ranks and bringing both characters to fight on the same side. Design-wise, Halo 2 is a bit more creative in its application of storytelling. In addition to bringing another player character into the fold, the varied environments and multiple antagonists definitely give Halo 2 a bit more of a blockbuster feeling than the first one, especially with the Anniversary enhancements. Halo 2 also added dual-wielding of weapons to the mix, and takes away the somewhat troublesome health bar that made you scramble for health packs in the first game’s campaign. In a lot of ways, it’s easy to see Halo 2 as the first “modern” Halo game because of its gameplay and storytelling additions, and all of this is only accentuated by the retouched visuals and sound. Although a more direct port of the first HD-game of the series, Halo 3 looks better than ever with upgraded resolution, an enhanced frame-rate, and even more fluid gameplay. Halo 3 picks up immediately after the cliffhanger ending to Halo 2, and details the Chief and the Arbiter’s discovery of the Covenant’s chief religious leader conspiring to build a new Halo to replace the one that Chief destroyed in the first game, threatening every being in the universe. The events of the three previous games come to a head, giving a seemingly definitive conclusion to the war between humanity and the Covenant, a bit of closure regarding the character of the Arbiter, and seemingly the end of the Master Chief. Since Halo 3 didn’t receive the “anniversary treatment” like the first two games in the series did, this is basically a direct port of the Bungie original, but that’s not to say that it isn’t enhanced by the increases in resolution or frame-rate. Halo 3 generally feels a bit looser on the controls than the first two games in the series, and the increased frame-rate definitely makes that feeling even more apparent. Still, Halo 3 is also the most impeccably designed of the original three games, though its narrative was somewhat disappointing because it feels like it came to a head a bit unceremoniously. The gameplay is also changed yet again by the fact that Halo 3 ejected the Arbiter as a playable character in the campaign, but the environments were also the most expansive at this point in the series. Everything about Halo 3 screams “big,” since this was believed to be the finale of the story. 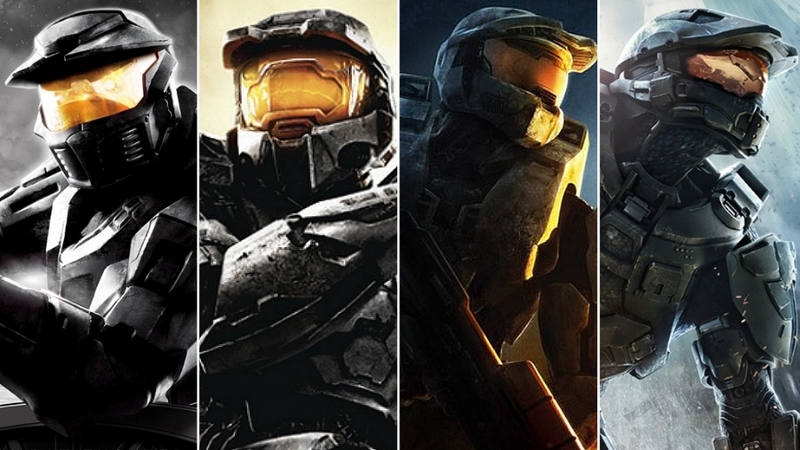 Which brings us to 2012′s Halo 4, picking up four years after the events of the third game. Halo 4 was the first entry in the series developed after Bungie had gone off to create their own new intellectual property, and its development was handled by 343 Industries, created internally by Microsoft to oversee future exploitations of the Halo franchise. Halo 4 marks a fundamental narrative shift for the series, since Master Chief was now a little more open to volunteering dialogue than he’d been in previous games. 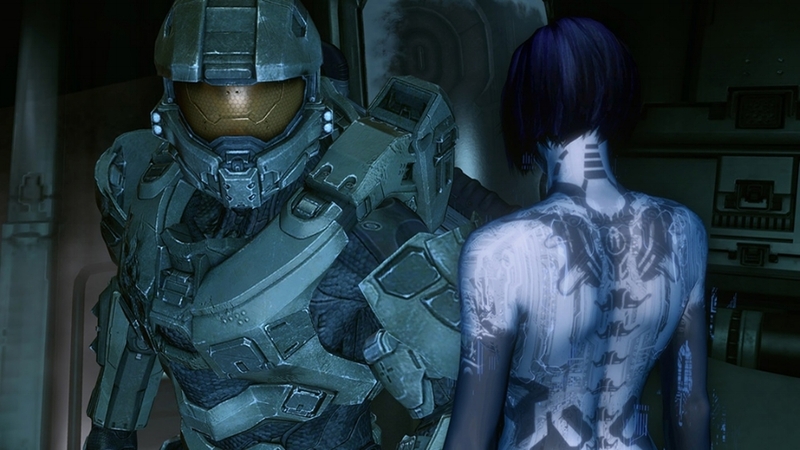 From being more of a silent observer to a more fully-fledged protagonist, Halo 4 is very much a story about the partnership between the Chief and Cortana, since his longtime A.I. companion is on the verge of deconstruction after not being maintained for over four years drifting in deep space. Everything about the design of the game feels bigger, but oddly more intimate since the dynamic between the two principal characters gets the lion’s share of the narrative focus. Halo 4 takes a rather different approach to the storytelling of the series, making Master Chief a more active participant in the narrative. This game also features his partnership with Cortana at the center of the plot, making for the series’ most character-driven story to date. The gameplay itself on the fourth game feels a bit tighter than the third game, a bit more actively inspired by the way that Halo: CE and Halo 2 played than later entries like Halo 3, and the games not included in this collection like Halo 3: ODST and Reach. Physics are a bit stronger overall and some welcome tweaks to the weapons, most notably the Chief’s trusty Assault Rifle, make for generally more accurate employment in tense situations. Halo 4 introduces a whole new class of enemies to the fight in the form of the Prometheans, deadly robots that have a connection to the mysterious Forerunner race, which constructed the Halo Array thousands of years ago. The Prometheans present a familiar level of difficulty to enemies like the Covenant, but with different attacks and levels of intensity, they definitely change up some of the fundamental gameplay of how you approach certain enemies. Overall, the arc presented by all four games is surprisingly awesome to take in all on one console, enhanced by the visual and auditory upgrades, the phenomenal new cinematics for Halo 2, and the unparalleled ease of being able to jump into any part of any of these games that you want on a whim. While the campaigns sometimes get overlooked in Halo games, the stories presented are great contributors to an exceedingly lush and vibrant sci-fi world, and it’s fortunate that for the most part, the storytelling that goes into those campaigns is also very compelling if you have the mindset to take them in. The Master Chief Collection was undoubtedly conceived as an effort to introduce an entirely new generation to the whole Halo series from the very beginning, and in that sense its an absolute success. The efforts of all involved definitely allow you to take in a grand story from beginning until now. Halo 2 Anniversary‘s multiplayer element is functionally identical to the game as it was released in November of 2004, with six new maps given the full remastering treatment. If you want, you can also play the original multiplayer mode with the classic graphical fidelity. Still, playing custom games with specific players in an Xbox Live friends list is possible, and there’s a lot of fun to be had there. For the first time, Halo: CE‘s multiplayer can be played over Xbox Live, instead of by having to physically link a bunch of original Xboxes together. All of the original experiences of all the games are available to play, along with all of their corresponding match types, all in their original engines: four separate, distinct games that have their own quirks (and original glitches) fully intact. It’s hard to express how helpful 60fps gameplay is in a multiplayer setting unless you’ve played it, so suffice it to say that the increased fluidity across all four games can definitely help you keep up with the competition. Multiplayer will likely be one of the primary reasons that people pick up the Master Chief Collection, and hopefully the issues will be resolved well before most people get their hands on their copy of it this coming holiday. 3,000 words later, I still don’t feel I’ve fully scratched the surface of everything that Halo: The Master Chief Collection includes, or can let you experience. If you’re a Halo fan and either have or will have an Xbox One, then this release is a no-brainer. While it weighs in at a hefty 60 GB, that size seems reasonable considering the sheer amount of content you have. That size, though, should definitely be a factor in deciding how you’d want to buy the game, as digital customers will need a pretty solid internet connection in order to fully download it. Still, The Master Chief Collection is a spectacular way to discover the story of the Master Chief, with incredible resolution and frame-rate, solid sound design, and all of the original functional greatness of the games as they were first released, all wrapped up in a compelling and sweeping, dense universe. This release provides one hell of a primer as we get ready for the release of Halo 5: Guardians, but beyond that, its a “greatest hits” collection of the highest order. Even if your interest in Halo is cursory, this is definitely the best way to play it. After everything, I think that’s the biggest compliment that can be paid to the massive beast known as Halo: The Master Chief Collection. The Master Chief Collection received a massive update in 2018, definitively making it the best place to play the original four Halo games and Halo 3: ODST, both in single player and online. Nearly five years ago, it was difficult to hide my rather effusive admiration for the original form of Halo: The Master Chief Collection, even in spite of a myriad of serious technical issues that quickly became a screw up of epic performance that will likely survive into the annals of video game history. I alluded to the multiplayer component being virtually unplayable in my original review, and in the end, nobody could’ve possibly anticipated just how long and arduous a road it would be to get that portion of this ambitious collection into a basic working condition. That effort ended up taking an inordinately long time, outlasting even the release of the next flagship title in the series — Halo 5: Guardians — that arrived nearly a year later. For years, Halo: The Master Chief Collection’s broken and unfinished state sat as a blight on the history of 343 Industries, and cemented a distinct lack of confidence from Xbox players and Halo series fans as they attempted to cement their status as the new stewards of the beloved franchise that Bungie created nearly 20 years prior. Surprisingly, though, Microsoft and 343 saw a new opportunity on the horizon, long after the dust settled on Halo 5’s time as the hot new title in the series. Over that horizon was a new opportunity in the form of new hardware within the Xbox One device family, a machine touted as “the most powerful console ever made.” Little did fans know that the arrival of the Xbox One X would bring with it a whole new lease on life for the thought-forgotten compilation release. How wrong we were. Thankfully, the full promise of Halo: The Master Chief Collection is now fully — and brilliantly — realized. Microsoft’s new, more powerful console — the Xbox One X — powers 4K gaming and a whole new series of opportunities for The Master Chief Collection. Announced in beta in 2017, the new update to The Master Chief Collection weighs in at a hefty 73 GB but comes with a series of notable and impressive updates and enhancements that take advantage of the new horsepower granted by the Xbox One X.